L' FAIR QUILTS: On the Design Wall: "Now What"?? On the Design Wall: "Now What"?? I mentioned a Trunk Show that I am working towards this August. One of our patterns, was born from all of the larger pieces of fabric in my stash (3 yards or more). You know, the kind that you absolutely love, but when you get it home it sits on the shelf. Every time you admire it (while it collects dust), you keep thinking...."Now What"? Well this pattern helps you work out the details and brings those fabrics to life. I purchased this awesome stripe from Robert Kaufman's Ombre Collection! NOW WHAT???? I pulled fat quarters, short cuts, and white backgrounds .... then started playing. Made a few blocks, played some more -- I love the design wall -- it has to be my favorite quilting tool (next to the rotary cutter). It is coming to life a little every night. I cannot wait to finish just to compare with the first one. The first quilt I made from this pattern, started with an awesome fabric purchased from the Camden Cafe line. What a difference in the look. The rest of the fabric just came from my stash .... lots of blacks and golds. 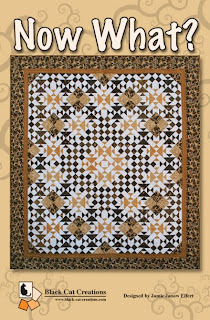 Because this one may stay on the Design Wall a couple of weeks while I play, I am so happy to have something to show and link to Patchwork Times' "Design Wall Monday". Judy is one of my favorite designers -- I am a piecer through and through and she is such a great inspiration. Love Now what - and your color choices! Happy sewing! 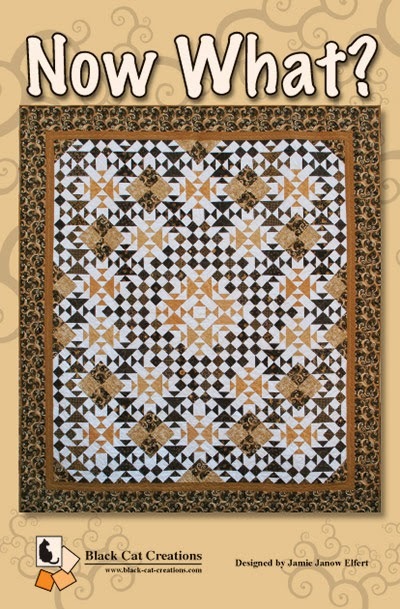 Neat design - so many of your quilts push all my favorite design buttons! Way to be inspired by your stash. Nice to see what's happening in LA.